LAWRENCEVILLE, N.J.— Rider University and 107.7 The Bronc are going BIG this Halloween season, on Friday October 28th The Bronc will be hosting Rider’s first ever drive-in movie, “Scream Screen.” A 40 foot by 22 foot screen, the largest on the east coast, will be setup on Rider’s campus mall screening a surprise movie voted on big students. Scream Screen will also feature Rider University’s first ever Trunk-Or-Treat, a feature that will allow sponsors of The Bronc to distribute products, swag and candy to Rider students to enhance the overall Halloween experience! 60 lucky students will have the opportunity to drive their vehicles on to Rider’s aforementioned campus mall and engage in the true classic feel of a drive-in movie, something that many students have never had the opportunity to experience. Scream Screen begins at 7pm with the Trunk-Or-Treat and will be followed by the screening of It’s The Great Pumpkin Charlie Brown at 8pm. Then the moment of truth, the winning selection of the Scream Screen voted on by Rider students will be reveled immediately following the classic Peanuts short. Earlier this year 107.7 The Bronc was award the Best College Radio Station in New Jersey by the New Jersey Broadcasters Association. 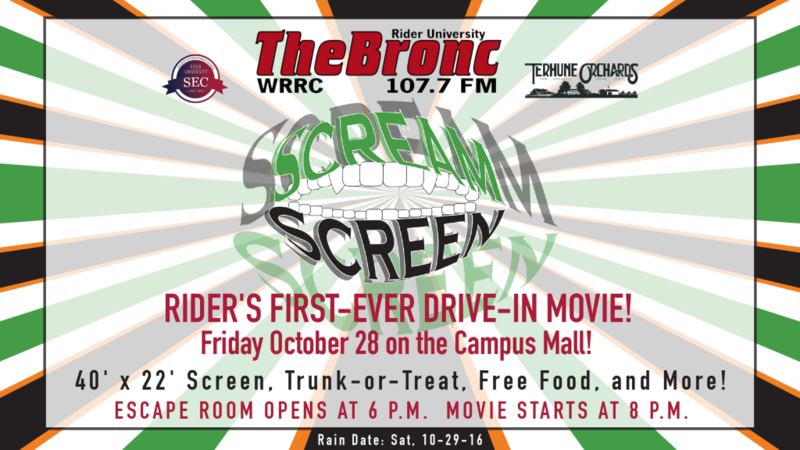 Scream Screen is sponsored by 107.7 The Bronc, Rider’s Student Entertainment Council and Terhune Orchards. For more information on Scream Screen visit 1077thebronc.com. Rider University, founded in 1865, is a comprehensive, private, coeducational university located in Lawrenceville and Princeton, New Jersey. With approximately 5,500 students studying at the undergraduate and graduate levels in the areas of business, education, liberal arts and sciences, music and the fine and performing arts, Rider’s academic experience offers a personal approach that is celebrated for educating talented students for citizenship, life and career success. More information can be found at www.rider.edu.